Are you an aspiring screenwriter who rushes applications for random submission opportunities? Do application fees feel more like impulse purchases versus strategic career investments? Does rejection fatigue and anxiety make you unable to write until the next late-notice opportunity pops up? Good news! You’re not unlucky; you’re unprepared. Here’s how screenwriters can submit more with hopefully better outcomes – or at least free you from the anxiety cycle caused by rushed submissions. Focus on writing a great script and then search for appropriate opportunities. Jeffery Lieber (Miami Medical, NCIS: New Orleans) often advises writers to skip screenwriting contests. Screenwriters should instead move to LA and network while working film jobs or pursue independent productions. 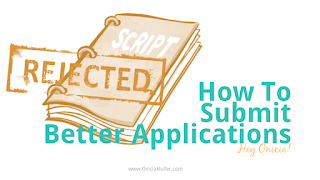 You shouldn't submit anything until you're really sure that your script id the best it can be -- wait ‘til you have great feedback from professional readers or a few top contest finishes. Now that you have a polished script, it’s time to fail. Some artists say you should aim for 100 rejections before giving up. This can be a lifetime or annually goal. Building stamina is the underlying idea of 100 rejections or 10,000 hours. Use sites like FilmFreeway, Without A Box, or the Black List to save research time by letting the opportunities come to you. Note: just like you don’t have to spend 10,000 hours on a single project to perfect your craft, you don’t have to – in fact, you shouldn’t – submit the same draft to 100 contests. There aren't that many worthwhile contests. More importantly, if your script doesn't do well in say ten contests, that's usually a sign that it needs more work. You should be exercising your writer’s muscle by completing more scripts. You improve your ability to bounce back from rejection by submitting more. It's a bit different if you're talking about submissions to companies and producers, though. At the time of writing, there were roughly 1,000 screenwriting contests on FilmFreeway. Unlike playwriting or submitting to publications, screenwriters face some of the highest submission fees for writing-oriented opportunities. While $25 is the average application cost, some exceed $70.00. Going with the average, attempting 100 fails could cost $2,500! Casting such a wide net isn’t necessarily the best approach in screenwriting, maybe for an independent production. Consider setting an annual budget. Prioritize writer initiative programs, diversity programs, or fellowships directly associated with studios or networks. After that, submit to anything that’s free and relevant to a script that’s already polished. Most opportunities are annual and require similar documents. Instead of starting each application from scratch, Donna Hoke offers excellent advice on how to be ready for any opportunity. Donna’s plays have been seen in 43 states. In short, she advises writers to save all submission materials in editable files. Even when typing directly into an online form, you should save your responses into a Word document. You’ll have the answers handy for the next submission or (fingers crossed) as a reference for interviews. Donna’s method also works for job applications. Having a stronger draft definitely helps with failing better. Consider staggering your submissions, so you have time to implement feedback or proofread. You can do this through various stages of the writing process is. Tightening your logline, outline, or getting professional script coverage can be worthwhile investments. Some contests like Screencraft’s Pilot Launch disqualifies your script if “becomes optioned, published, produced or purchased between the time of submission and the end of the judging period.” Staggering ensures you don’t waste money and never had to choose between two acceptances. After polishing my web series script, I broke my 2-year no submissions drought and tried Donna’s method. Submitting that script to 12 opportunities resulted in three semi-finalists placements. The following year I sent three new works to 15 contests. I earned one acceptance/win. Confession: I kind of rushed those project. However, if I count my submission for freelance writing and comedy gigs, I have a higher success rate. Surviving 100 rejections is easier when you do the prep work and practice the first tip. Playwright, Matthew Weaver attempted 365 submissions in 2017. He’s also familiar with Donna’s method. “I wound up with 413 submissions. I'd seen a lot of advice for writers and playwrights that you have to keep putting the work out there, the same as having to actually do the work of writing. It was just a matter of being more diligent and actively looking for opportunities through a variety of sources. It also required a bit of a shift in thinking: Instead of making a production the end-goal, the submission became the goal. Any acceptance was icing on the cake. I think of it as being like Benjamin Franklin: I've got the kite up in the sky, and I'm sending up key after key after key, trying to get as many places as possible for lightning to strike. There you have it. To be less unlucky, try being more prepared.